IoT: Story Of The Future. A journey in the world of sensors, automation and a lot more! I am a physical coke machine with some special hardware attached to my empty lights. 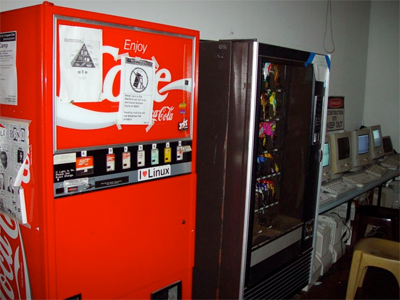 Since my empty lights blink on a dispense, it is possible to count the number of sodas still inside me and send this information over the local net to a local Unix machine. (and BigData? And Artificial Intelligence? And who knows what else?). When ReFab first sought funding in 1990, people laughed in founder Rae Birkan’s face. Who on earth was going to buy clothing made from — gasp! — used, old clothing? Why waste money on a company built on waste? Where Designers, Engineers and Architect meets. A great place where to start a movement right?